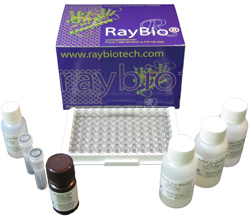 RayBio® Transcription Factor Activity Assay kits are in vitro enzyme-linked immunosorbent assays for the semi-quantitative measurement of active transcription factors in nuclear extracts and cell lysates. The RayBio® Transcription factor-Enzyme Linked Immunosorbent Assays are non-radioactive transcription factor assays with an ELISA format. They offer an easy, speedy, sensitive and high-throughput method to detect the activation of transcription factors. Double stranded oligonucleotides are coated in a 96 well plate. 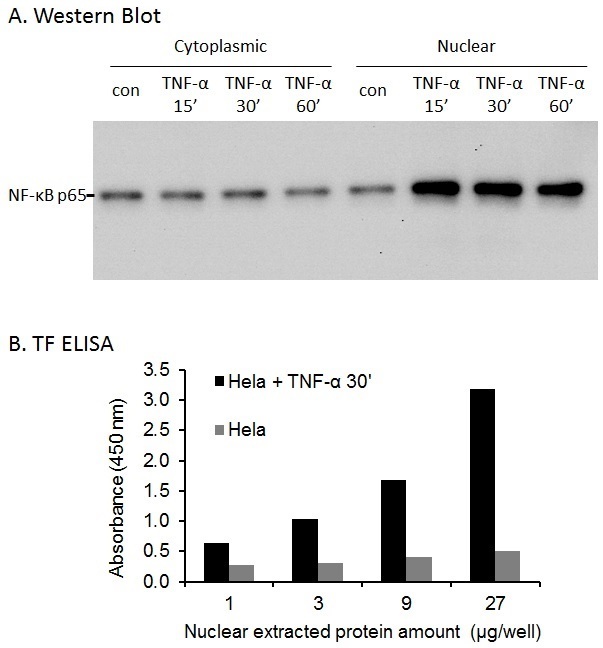 These oligonucleotides specifically capture the target transcription factor contained in whole cell lysate or nuclear extracts after a short incubation. Subsequently, the primary antibody recognizes the target transcription factor-DNA complex in each well, and a HRP-conjugated secondary antibody is then used for detection. After washing away any unbound antibody, signal can be obtained easily through a colorimetric assay with a spectrophotometric plate reader at 450 nm. The specificity of the reaction between the target transcription factor and the DNA probe is additionally stringent because of the establishment of specific competitive DNA and non-specific competitive DNA probes in this reaction system.